David Gilliland picked up the 4th last-place finish of his NASCAR Sprint Cup Series career in Sunday’s Toyota / Save Mart 350 at the Sonoma Raceway when his #38 Love’s Travel Stops Ford was involved in a single-car crash that ended his run after he completed 20 of the race’s 110 laps. The finish was Gilliland’s first of the 2015 season and his first in a Cup race since last year’s Coca-Cola 600 at Charlotte, 40 races ago. The finish occurred in Gilliland’s 310th series start. 2015 marks Gilliland’s sixth consecutive season driving for Bob Jenkins’ Front Row Motorsports, a team which in that time had grown from a struggling single-car operation to a three-car team. Though Gilliland has still yet to visit victory lane, he has continued to surprise at several races, most notably at Talladega in 2013 when he pushed teammate David Ragan to the win for the team’s first 1-2 finish. Gilliland’s best finish this year also came on the restrictor-plate tracks when he finished 11th in the Daytona 500. However, consistency has been a challenge this year- a crash last week at Michigan left Gilliland a season-worst 42nd, dropping him to 28th in points. Gilliland had reason to be excited that Sonoma was the next race on the schedule. The track was the scene of his Cup debut in 2006, when his upset victory in the XFINTY Series race at Kentucky secured him ride in Bryan Mullet’s #72 Dutch Quality Stone Dodge. Gilliland finished 32nd that day, avoiding several multi-car pileups, and just two years later earned a career-best finish of 2nd to Kyle Busch in one of the final top-five finishes earned by Yates Racing. In nine previous starts, he had finished no worse than 32nd and had scored a pair of Top-20 finishes: a 12th in 2011 and a 19th in 2010. He’d also scored two K&N Pro Series West victories at the track in 2007 and 2012. Gilliland was one of 44 cars who arrived to attempt to make Sunday’s 43-car field. In the opening practice on Friday, he turned in the 19th-fastest time, then moved to 16th-best in Happy Hour that afternoon. In qualifying, he timed in just 28th at an average speed of 94.841 mph, but timed in ahead of both teammates Cole Whitt in 29th and road racer Justin Marks, making a one-off in FRM’s #34, in 35th. Missing the race was the unsponsored Premium Motorsports #62 of Brendan Gaughan, ending the Truck Series veteran’s bid for his first Cup start at Sonoma since 2004. On Sunday, the 43rd starting spot belonged to Jeb Burton, making his Sonoma debut in the #26 Maxim Fantasy Sports Toyota for BK Racing. Burton was joined at the start by two drivers who fell to the rear for engine changes - Paul Menard in the #27 Richmond / Menards Chevrolet and the #46 Bene-fit Chevrolet of Michael Annett. Annett had struggled tremendously in his second Sonoma weekend, having lost a transmission in practice before the engine let go. When the green flag fell, Burton was already running 43rd in Turn 12, but on the next lap he was passed by the #7 Golden Corral Chevrolet of Alex Bowman. Burton retook 43rd on Lap 4, and by Lap 6 the entire Bottom Five had started to lose touch with the field. At that time, the four cars in front of Burton were 42nd place Annett, 41st-place Landon Cassill, the defending last-place finisher in an unsponsored #40 Hillman Racing Chevrolet, 40th-place Bowman and 39th-place Josh Wise, his #98 back in the Dogecoin Digital Currency colors for the first time since Talladega last fall. On Lap 7, Burton began to fight Annett for the 42nd spot, diving into Turn 11 and locking the brakes before falling back again on the exit. Burton succeeded the next time by, but by then he, Annett, and Cassill had fallen back even further from Bowman and Wise. The next change for last occurred on Lap 10, when Jamie McMurray’s #1 Cessna / Beechcraft Chevrolet picked up a vibration for a blistered tire and made an unscheduled stop. He rejoined the track about four seconds behind Annett, but made up the distance in 4 laps to pass Annett for 42nd in Turn 11. By then, Paul Menard had also made an early stop and rejoined the race 43rd, though still on the lead lap. More early pit stops jumbled the Bottom Five on Lap 17 when Bowman followed Denny Hamlin to pit road, putting Bowman to the last spot. On Lap 21, Bowman was still running last when trouble found Gilliland. After the interview, I watched as crew chief Donnie Wingo and the team helped unload the wrecked #38 from the flatbed. The team wasn’t in a rush to make repairs as the left-front wheel was shoved back against the firewall, and over time the team began to load up their hauler. Theirs was the first to leave minutes after the checkered flag. Gilliland now sits 29th in points heading to Daytona, where last year he started on the pole. On my way to the media center, the caution flew once again on Lap 30 for a wreck in the Esses. This time, the victim of the tire barriers was 2nd-place point man and 2013 winner Martin Truex, Jr., whose #78 Furniture Row Chevrolet had tangled with the #55 Aaron’s Dream Machine Toyota of David Ragan. I turned around and headed back to the medical center, where this time twice as many media members appeared to interview Truex. Heading back to the media center once more, however, it was clear the Furniture Row Racing team wasn’t finished yet. With team owner Barney Visser watching from behind, no less than ten crew members including Pearn were cutting away the front valence and welding the frame back together. An oil drum outside the stall was stuffed with tattered bits of fiberglass that, moments later, was revealed to be just about everything forward of the firewall. Incredibly, on Lap 70, the crew brought Truex’s helmet back to the garage area. Truex climbed in and rolled back onto the track for at least two laps. However, despite the team’s best efforts, the car apparently couldn’t handle very well, and it pulled off the track for good after it had completed 31 laps, leaving Truex 42nd. I was in the garage area again the instant Truex had pulled onto the track, joined by polesitter A.J. Allmendinger whose #47 Kingsford / Bush’s Beans / Scott Products Chevrolet had a fuel system issue ten laps earlier. At that moment, the caution fell a third time for another single car wreck coming out of Turn 10, this one involving the #23 Dr. Pepper Toyota of J.J. Yeley. In a wreck similar to Richard Petty’s at Sonoma in 1990, Yeley lost control exiting the corner and hit the barrier near the old timing and scoring building near the entrance to Turn 11. Yeley managed to drive his machine onto pit road, where he made the left turn at the far end of pit road to go behind the wall. I arrived at the small overflow garage near the Goodyear headquarters to see Yeley’s #23 on jack stands, the crew pondering the severe damage to the right-front of the machine. Yeley was exhausted, sitting in the shade against the building. Still, he was kind enough to talk to me about the accident. As I left, Yeley’s crew put the #23 on rollers and pulled it backwards toward the hauler, out of the race in 41st spot. Once again, another multi-car accident brought out another caution, and I took another detour back to the medical center. This time, two ambulances rolled up with Carl Edwards and David Ragan, who locked wheels and stuffed their machines into the tires in the Esses. Again, both drivers were unhurt, and surprisingly, neither seemed very irritated with each other. Edwards in particular looked like he just hated to have the race end early as he was having fun out there. 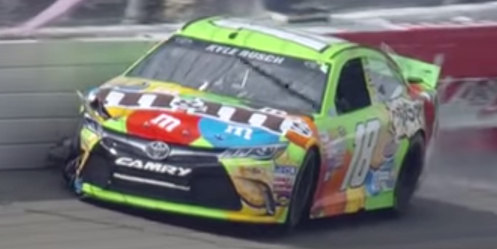 In the end, Kyle Busch, last in the previous Cup race at Michigan, rebounded to claim his first victory of the 2015 season, and is now set to challenge for a spot in the Chase. Another feel-good story on the day was that of Fontana last-placer Sam Hornish, Jr. On Sunday, Hornish made his first Cup start at Sonoma since 2010, timed in 3rd in the late stages of the opening practice, and finished a strong 10th in the #9 Jacob Companies Ford. In three previous starts at the track, Hornish had finished no better than 31st. 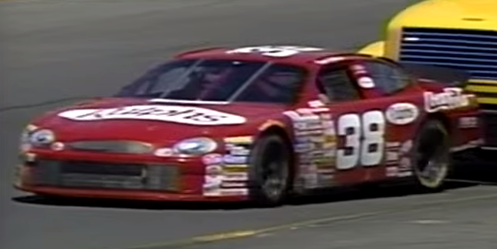 *This finish marks the first time the #38 has finished last in a Cup race at Sonoma since June 27, 1999 when Gilliland’s father Butch Gilliland trailed the Save Mart / Kragen 350 after his Richard Hilton-owned #38 Ralph’s / Food 4 Less / Coca-Cola Ford lost the engine after 3 laps. According to RacingWest.com, the engine used that day was the backup motor for Darrell Waltrip’s #66 K-Mart Ford. It was the 10th and final Cup start of Butch’s career, which included eight Sonoma starts when the event’s entry list welcomed both Cup drivers and Winston West competitors (now K&N Pro Series West). Two of Butch’s 15 K&N Pro Series West wins were in these “companion events” at Sonoma in 1994 and 1997. He also participated in all three of NASCAR’s exhibition races in Japan from 1996 through 1998 with strong finishes of 10th, 9th, and 16th, respectively. As a curious side-note to Jeff Gordon’s final race at Sonoma, Butch Gilliland was the last driver other than Gordon to run the #24 in a Cup race. On November 1, 1992, just fourteen days before Gordon’s Cup debut in the historic Hooters 500 at Atlanta, Gilliland drove his family-owned #24 Anaheim Electric Gear Pontiac to a 29th-place finish in the Pyroil 500 at Phoenix. The Leavine Family Racing team (LFR), which campaigns the #95 Ford in the NASCAR Sprint Cup Series, expects to move back to their Concord, NC shop after the Kentucky race on July 11, according to driver Michael McDowell. The fire, whose cause has still not been reported, damaged much of the shop including the car McDowell raced at Sonoma in 2014. McDowell finished 34th on Sunday. 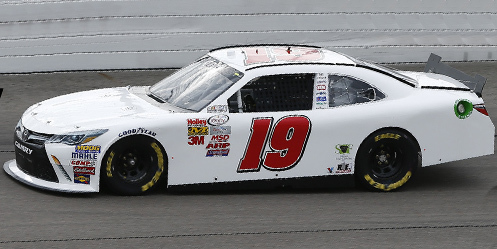 Jeff Green picked up the 67th last-place finish of his NASCAR XFINITY Series career in Sunday’s Owens Corning AttiCat 300 at the Chicagoland Speedway when his unsponsored #19 TriStar Motorsports Toyota fell out with a vibration after he compelted 2 of the race’s 200 laps. The finish was Green’s seventh of the 2015 season, his third in four races, and his first since Dover, two races ago. The finish occurred in Green’s 402nd series start. Green, back in the #19 for the fourth-straight race, was one of 37 competitors on the initial entry list. By Friday, the list increased to 39 with Mike Harmon in his #74 Dodge and Peyton Sellers in Obaika Racing’s #97 Vroom! Brands Chevrolet. The next day, Jimmy Means Racing entered a second car to make a full field of 40 - a flat white #79 Chevrolet with Matt Frahm aboard. Much like the #79 that Means entered for three races last year, starting at Fontana, Frahm’s ride was a backup #52 Chevrolet for Joey Gase with the numbers covered up. Frahm and Green were the only two drivers who did not participate in Friday’s opening practice, but both returned in Happy Hour to run 38th and 40th, respectively. Green picked up speed in qualifying, securing the 29th starting spot at an average speed of 170.578 mph. However, just 2 laps into Sunday’s rain-postponed race, Green pulled his car behind the wall, followed 3 laps later by Frahm. 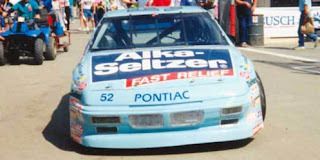 38th place went to Scottish driver John Jackson, who was making his first start since Iowa in Motorsports Business Management’s #40 Braille Battery / Grafoid Dodge. Carl Long was originally slated to drive one of MBM’s entries on Sunday, but was injured in a hard crash at Dover. Josh Reaume was tabbed as Jackson’s teammate in MBM’s #13, which came home 33rd, 54 laps down. 37th went to 73-year-old Morgan Shepherd, making his fifth start of the season and first since Dover, his #89 Racing With Jesus Chevrolet out with handling issues. Rounding out the Bottom Five was ARCA veteran Bobby Gerhart, his first XFINITY start of the season in JD Motorsports’ #0 Gerber Collision & Glass Chevrolet. Gerhart was a last-minute appointment to the ride after Ross Chastain was moved to Landon Cassill’s #01 with Harrison Rhodes in Chastain’s #4. Chastain and Rhodes finished 18th and 25th, respectively. *This is Green’s first last-place finish in an XFINITY Series race at Chicagoland since September 14, 2013 when his #10 TriStar Motorsports Toyota fell out with a vibration after 3 laps of the Dollar General 300 powered by Coca-Cola. The #19, however, had never before finished last in an XFINITY race at Chicagoland. *Toyota has now finished last in seven consecutive XFINITY Series races. Caleb Roark picked up the 5th last-place finish of his NASCAR Camping World Truck Series career in Friday’s American Ethanol 200 presented by Enogen at the Iowa Speedway when his #0 Driven2Honor.org Chevrolet fell out with a vibration after he completed 5 of the race’s 200 laps. The finish was Roark’s second of the 2015 season and his first since Kansas, five races ago. Roark is now tied with Norm Benning as the only repeat last-placers in the 2015 Truck Series season. The finish occurred in Roark’s 17th series start. Friday’s race was Roark’s first since the last-place run at Kansas, his #0 Chevrolet driven twice during that span by Texas last-placer Adam Edwards. The defending LASTCAR Truck Series champion was not originally on the entry list for the Iowa event. There were only 29 competitors at first publication, but by Monday the list grew to a full 32 with the additions of Jordan Anderson in Mike Harmon’s #74 Chevrolet and MAKE Motorsports teammates Ryan Ellis (#1) and Travis Kvapil (#50). However, after the withdrawal of Ted Minor in Joseph Cefella’s #12 FindIt.net Chevrolet, team owner Jennifer Jo Cobb added Roark’s #0 to keep the field at 32. Roark was the slowest truck in Friday’s lone practice session, turning in just two laps that were 4.5 seconds slower than those of eventual race winner Erik Jones. He slotted into the 32nd spot in qualifying with a lap of 120.560 mph and did not relinquish the spot. Moments before the first caution flew for Spencer Gallagher and Cole Custer’s wreck in Turn 2, Roark pulled behind the wall. Roark edged 31st-place finisher Justin Jennings by 10 laps, Jennings extending his bottom-five streak to five straight races. 30th went to Mike Affarano, who has now made four Truck Series starts in 2015 including the last three in a row. Affarano’s distinctive pink #03, still without sponsorship, exited after 22 laps with a vibration. Rounding out the Bottom Five were Ryan Ellis in MAKE Motorsports’ #1 Altex / Shane duncan Band “Life’s Snooze Bar” Chevrolet and the #45 Trijicon / Cope’s Distribution Chevrolet of Tommy Regan, both retired in the first quarter of the event. All 13 drivers who finished 19th or worse on Friday were driving Chevrolets. 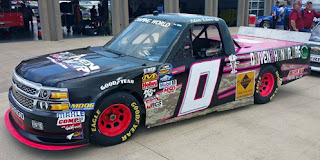 *This is the third last-place finish in the last four Truck Series races at Iowa for the #0 owned by Jennifer Jo Cobb. In 2013, Chris Lafferty swept both last-place finishes in Cobb’s #0, which was then a Ford. Roark himself had never before finished last in a Truck race at the track. Kyle Busch picked up the 5th last-place finish of his NASCAR Sprint Cup Series career in Sunday’s Quicken Loans 400 at the Michigan International Speedway when his #18 M&M’s Crispy Toyota fell out after a single-car accident ended his run at 52 of the rain-shortened 138 laps. The finish, which occurred in Busch’s 369th series start, was his first of the 2015 season. It was also his first in a Cup race since September 21, 2008, when his #18 Interstate Batteries Toyota lost the engine after 172 laps of the Camping World RV 400 presented by AAA at Dover - 239 races ago. That last-place run in 2008 derailed Busch’s impressive first season with Joe Gibbs Racing in the flagship #18, an eight-win season resulting in just a 10th-place finish in the standings. In the six seasons that followed, Busch would win 17 more Cup races while dominating both the XFINITY and Truck Series as a part-time competitor. It was during one of these bonus races in February where Busch suffered a broken right leg and left foot after crashing into an unprotected fence, the injuries taking him out of his car until just last month at Charlotte. Saturday at Michigan, Busch returned to the XFINITY Series for the first time since Daytona and took the victory - his 71st in just 298 series starts. This done, Busch looked to Sunday’s race and his continued effort to make the field for this year’s Chase. Granted a medical exemption by NASCAR officials, Busch would still have to win a race and average a 17th-place finish to make the cut. Unfortunately, an 11th-place run at Charlotte and 9th at Pocono was weighed down by a costly wreck at Dover that left him 36th, dropping his average to 18.67. With just 12 chances left to win, Busch knew that a weekend sweep would be a game-changer. Busch turned in the 18th-fastest lap in Friday’s opening practice and timed in 10th in qualifying as the second-fastest Toyota behind teammate Carl Edwards. Busch then jumped to 4th-fastest in the second practice session and was 2nd to Jeff Gordon in Happy Hour. On Sunday, Matt DiBenedetto started 43rd in BK Racing’s #83 Burger King Toyota, joined by teammate J.J. Yeley after his engine change in the #23 Dr. Pepper Toyota, but neither held the spot for long. Heading into Turn 3, Alex Bowman’s 36th-place #7 Racing-Rewards.com Chevrolet slid up the track with an apparent cut right-rear tire. Bowman immediately cut to pit road, the stop costing him two laps. He got one lap back during the first of several rain-caused cautions on Lap 12, but just before the Lap 19 restart lost another right-rear tire, shredding away the crush panels and prolonging the yellow. Bowman pulled behind the wall to allow the crew to make repairs while the other 42 competitors remained on the lead lap. Then, on Lap 53, Busch found trouble. Running 6th during a restart after another rain delay, Busch’s #18 was trying to pass brother Kurt Busch’s #41 HAAS Automation Chevrolet for 5th when Kyle lost control and slapped the outside wall with the right-front and right-rear of his machine. Fortunately uninjured in the accident, Busch was able to drive his car to the garage area. By that time, Busch had fallen to 42nd, a handful of laps ahead of the still-stopped Bowman. The two were joined on Lap 64 by David Gilliland, whose #38 Love’s Travel Stops Ford smacked the outside wall but did not bring out the caution. On Lap 73, Bowman returned to the track 51 laps down. Busch’s team was still trying to make repairs, no one certain whether the persistent rains would end the race at Lap 101. When the skies cleared, Bowman continued on track while Busch remained in the garage area, allowing Bowman to bump Busch to last on Lap 104 and Gilliland to 42nd on Lap 117. When the heaviest rainfall yet ended the race at 138 laps, both Busch and Gilliland were still in the garage area and out of the race. Bowman came home as the final car under power, 52 laps down. Rounding out the Bottom Five were Mike Bliss in Archie St. Hillaire’s #32 Skuttle Tight / CorvetteParts.net Ford with DiBenedetto in 39th also four laps down. With 11 races remaining, Busch’s average finish in 4 Cup starts this year is now 24.8. *This is the first last-place finish for the #18 in a Cup race at Michigan since June 20, 1976 when Joe Frasson’s #18 Excuse Lounge Chevrolet lost the engine after 1 lap of the Cam 2 Motor Oil 400, won by David Pearson. Frasson, a temperamental owner-driver from Golden Valley, Minnesota, made 107 Cup starts from 1969 through 1978. His best career finishes were a pair of 3rd-place runs at Darlington in 1972 and at Texas World Speedway in 1973. Frasson’s brightly-painted machines occasionally carried sponsorship which ranged from Pizza Hut to his family’s cement company. *Busch previously finished last in a Cup race at Michigan just one other time - on August 21, 2005, Busch’s #5 Kellogg’s Chevrolet started 4th and led 28 laps, but overheated after 81 circuits due to debris that became stuck to the front valence. That same race, the GFS Marketplace 400, saw Jeremy Mayfield’s 5th and most recent Cup Series victory. C.J. 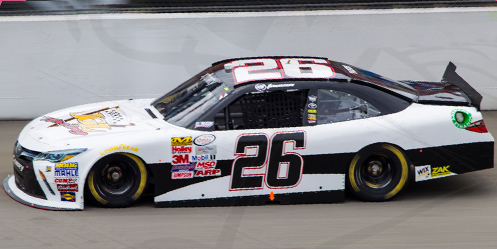 Faison picked up the 1st last-place finish of his NASCAR XFINITY Series career in Saturday’s Great Clips 250 at the Michigan International Speedway when his #26 JGL Graphics Toyota was unable to start the race. The finish occurred in what was to be Faison’s 2nd series start. Just 21 years old, Faison already has 16 years of racing experience, having worked his way from the go-kart tracks of the northeast to the K&N Pro Series East and Dirt Late Model divisions. In 2013, he made his Truck Series debut at Dover, finishing 30th for Ken Smith, then just two rounds later jumped to 19th at Kentucky in Bobby Dotter’s #81 SS Green Light Racing Toyota. With a contract signed to run select Truck races for Premium Motorsports while developing his own race team, Faison set his sights on the XFINITY Series for which he tested in 2013. In this series, Faison has found a home with JGL Racing. JGL was formed last year by Gregg Mixon, a longtime XFINITY Series owner who was making his return to the series after a decade’s absence. 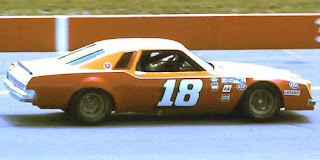 In the aftermath of Dodge’s exodus from NASCAR, Mixon bought old XFINITY cars from Penske Racing and ran two cars with a mix of veteran and rookie drivers. The car number that would become Faison’s ride was to be a part-time third team for the restrictor-plate races in 2015 with Mike Wallace aboard while Eric McClure brought his Hefty and Reynolds Wrap sponsorship to fund one of JGL’s two full-time rides. However, when McClure and his sponsors returned to TriStar Motorsports after Talladega, JGL went back to running two cars once more - the #28 of J.J. Yeley and the #26 to be driven by series newcomers like Faison. Faison made his XFINITY Series debut at Dover on May 30, starting 37th and finishing 23rd, six laps down. He was tabbed to return for Saturday’s next round at Michigan, where he turned in the 27th-fastest time in Friday’s only practice session. In Saturday’s qualifying session, Faison had just turned in the 30th-fastest time on his second lap at an average speed of 187.110 mph when a bizarre accident ended his afternoon. Coming off Turn 4, his car ruptured a water line that got moisture under his wheels. The #26 switched ends and backed into the outside wall. Faison was uninjured and attempted to help his crew fix the machine for that afternoon’s race. Despite the team’s best efforts, Faison’s car was pulled behind the wall before the start, unable to compete in the race. For the seventh time this season, TriStar Motorsports and Motorsports Business Management finished nose-to-tail in the Bottom Five, this time with current LASTCAR XFINITY Series leader Jeff Green in TriStar’s unsponsored #19 coming home 39th, 29 laps behind Carl Long in MBM’s #40 Braille Battery / Grafoid Dodge. 37th went to 1990 Daytona 500 winner Derrike Cope with Jackson Coffee Co. on his self-prepared #70 Chevrolet, equaling Cope’s worst finish of the year at Bristol. 36th place ended up with Blake Koch, one of Green’s teammates at TriStar, in the #8 Leaf Filter Gutter Protection Toyota. *Faison is the first XFINITY Series driver to finish last due to being unable to start the race since June 2, 2012, when Tony Raines’ #70 Black Cat Fireworks Chevrolet for owner Jay Robinson could not get going in the 5-Hour Energy 200. *This is the first last-place finish for the #26 in an XFINITY Series race since October 15, 2010, when Parker Kligerman’s #26 Roger Penske-owned Dodge started 8th but crashed after 3 laps of the Dollar General 300 at Charlotte. It is the number’s first XFINITY last-place run at Michigan. *This is the first last-place finish for JGL Racing since last June, when Kevin Lepage lost the rear gear o his unsponsored #93 JGL Racing Dodge and did not complete a lap of the Gardner Denver 200 at Road America. Joey Gattina picked up the 1st last-place finish of his NASCAR Camping World Truck Series career in Saturday’s Drivin’ For Linemen 200 at Gateway Motorsports Park when his #57 Truckworx Kenworth Chevrolet fell out with engine problems that kept him from completing any of the race’s 160 laps. The finish occurred in Gattina’s series debut. Like Adam Edwards, who trailed the field last week at Texas, Gattina is a driving instructor, having worked at the Dale Jarrett Racing Adventure at the Talladega Superspeedway in his native Alabama. Last year, Gattina made his second ARCA Racing Series start at the Talladega track, finishing 31st for longtime owner-driver Wayne Peterson in the #06 Robby Wells For President / Griffin Services Chevrolet. Gattina finished a career-best 21st in his only other series start at Mobile earlier that year, again with Peterson. Gattina’s ride for Saturday was a second bright red Chevrolet owned by owner-driver and current 2015 LASTCAR Truck Series leader Norm Benning. 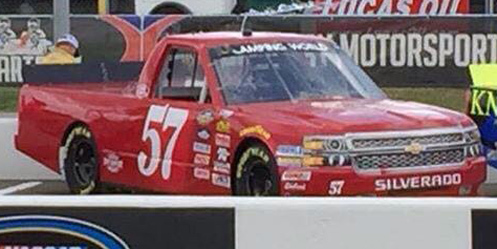 Benning, who again ran his #6 Boedeker Construction Chevrolet on Saturday, entered his second #57 truck for the first time in 2015 as one of three post-entries. These three trucks finally made a full field of 32 after the preliminary entry list contained just 26 trucks. As at Texas, the other two post-entries were Mike Affarano’s #03 Affarano Motorsports Chevrolet and Texas last-placer Adam Edwards in Jennifer Jo Cobb’s #0 Driven2Honor.org Chevrolet. Gattina’s truck was the final addition, added on the day of the race. Gattina was the slowest driver in Saturday’s only practice session, running a single lap of 94.897 mph. He secured the 32nd and final starting spot when qualifying was washed out, forcing the field to be set by those practice speeds. In the first 13 laps of Saturday’s race, all three post-entries were the first to pull behind the wall. After Gattina did not complete the opening lap, Edwards and Affarano both retired in 6 and 7-lap intervals. The next truck to fall out was the #36 Mittler Bros. Machine & Tool Chevrolet of Justin Jennings, his fourth-straight Bottom Five. Rounding out the group was Mason Mingus, who brought out the first caution of the night after his unsponsored #15 Billy Boat Motorsports Chevrolet tangled with Justin Bottom’s #54 ROK Mobile Toyota on Lap 53. *This is he first last-place finish for the #57 in a Truck Series race since last September, when Ted Minor also failed to complete the opening lap in Benning’s second truck due to clutch issues in the UNOH 175 at the New Hampshire Motor Speedway. The finish was also the first of Minor’s career. The number had never before finished last in a Truck race at Gateway. Aric Almirola picked up the 5th last-place finish of his NASCAR Sprint Cup Series career in Sunday’s Axalta “We Paint Winners” 400 at the Pocono Raceway when his #43 Nathan’s Famous Hot Dogs Ford lost the engine after he completed 88 of the race’s 160 laps. The finish was Almirola’s first of the 2015 season and his first in a Cup Series race since last year at Fontana, 45 races ago. Coming into the Pocono race, Almirola had just finished a season-best 5th at Dover, putting him 10th in the series standings. This also put him 5th among drivers without a win in 2015, trailing only Martin Truex, Jr., Jamie McMurray, Kasey Kahne, and Jeff Gordon. Quietly, Almirola had put together his most consistent start to date - he hadn’t finished any worse than a 26th-place run at Las Vegas and had completed all but five laps. Unfortunately, while Truex’s winless streak came to an end Sunday, Almirola’s streak ended as well. For the second-straight year, the Pocono event would be the first of two NASCAR events to hold qualifying events for next month’s Nathan’s Hot Dog Eating Contest, the other being the Sonoma Raceway in three weeks. To mark the occasion, Almirola’s #43 would carry primary sponsorship from associate supporter Nathan’s on a blue-and-gold paint scheme. The car was 26th-fastest in the opening practice and qualified 25th in Happy Hour, putting up a speed of 174.791 mph. On Saturday, he improved further to 24th in the second session before he dipped to 28th in Happy Hour. Just 43 cars showed up to attempt the race, so the 43rd starting spot went to Brendan Gaughan in his unsponsored black #62 Chevrolet for Premium Motorsports. On Sunday, Gaughan, who has now made 2 straight races after 6 DNQs in 2015, was briefly joined by Joey Logano, sent to the rear after a rear gear change before the race. Logano quickly moved through the field while Gaughan held 43rd for the first 21 laps and was the first to be lapped on Lap 18. Green flag stops shuffled the entire field, putting Josh Wise in 43rd on Lap 22, then Jeb Burton on Lap 23 with Burton’s #26 Maxim Fantasy sports / Estes Express Lines Toyota becoming the first to lose two laps on Lap 26. Travis Kvapil’s first start of the year in the #32 ReallyCheapFloors.com / VictoryPress.biz Ford briefly dipped to 43rd on Lap 28, a spot he held until Lap 30 when Paul Menard lost the left-front tire on his #27 Schrock / Menards Chevrolet in Turn 2. On Lap 36, 43rd spot changed hands again, this time going to Burton’s BK Racing teammate J.J. Yeley in the #23 Dr. Pepper / Heinz Toyota. Yeley had picked up a bag on his grille, causing his machine to overheat and make a unscheduled stop for the crew to raise the hood. He was just underway again, 4 laps down, when the second caution of the afternoon flew on Lap 70. Ricky Stenhouse, Jr., running 17th in his #17 Zest Ford, lost the brakes racing into Turn 2 and slapped the outside wall hard. Uninjured, but too frustrated to talk with reporters, Stenhouse dropped through the field only to be denied 43rd by last-place starter Gaughan, whose lapped machine had gone behind the wall just before the incident. At the time, Gaughan was one lap behind Stenhouse. Almirola didn’t play a role in the LASTCAR battle until Lap 80, when his car suddenly sounded flat coming down the front straightaway. He struggled to keep up the pace, the gauges on his #43 reading normal but the car struggling to take any fuel. Soon, the car began to trail smoke. On Lap 88, a debris caution allowed Almirola to make it to pit road for the crew to have a look, but when he pulled off pit road, the car was pouring smoke worse than before. He then pulled behind the wall the next time by, dropping him into the Bottom Five. On Lap 90, Gaughan returned to the track, and one lap later Stenhouse slipped to 43rd. If he stayed there, it would mark not only Stenhouse’s first last-place finish in 90 Cup starts, but also the first back-to-back lasts by Roush-Fenway Racing since Matt Kenseth lost the engine in 2003’s finale at Homestead and Mark Martin’s let go in the 2004 Daytona 500. 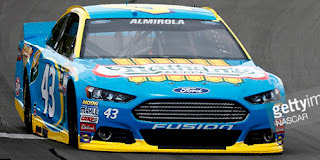 Almirola, meanwhile, slipped behind Yeley’s lapped machine to the 42nd spot on Lap 110. Finally, on Lap 123, Stenhouse brought his battered car back onto the track just in time for the restart following Sam Hornish, Jr.’s hard crash in Turn 1. The wreck put both Richard Petty Motorsports cars in the Bottom Five while Stenhouse’s return meant Almirola would fall to last if the #17 finished under power. Stenhouse did, in fact, make it the rest of the way, and Almirola fell to 43rd with 16 laps to go on Lap 144. Stenhouse remained 42nd, Hornish in 41st, and Gaughan in 40th was finally felled by electrical issues. Rounding out the Bottom Five was Ryan Newman, whose #31 Grainger Chevrolet wrecked while racing A.J. Allmendinger for the 7th spot with just 18 circuits remaining. Almirola still sits 12th in the series standings heading to Michigan next week. *This marks the first last-place finish for both Almirola and the #43 in a Cup race at Pocono. Adam Edwards picked up the 1st last-place finish of his NASCAR Camping World Truck Series career in Friday’s WinStar World Casino & Resort 400 at the Texas Motor Speedway when his #0 Driven2Honor.org Chevrolet fell out with rear gear issues after he completed 5 of the race’s 167 laps. The finish occurred in Edwards’ 7th series start. Edwards, a graduate of Virginia Tech and an instructor at Andy Hillenburg’s Fast Track High Performance Driving School, got his start as an owner-drier in 2002 running in the pure stock division of the NASCAR Weekly Series. In 2007, he broke into the national ranks by making 5 ARCA Racing Series starts that year with a best finish of 17th at Pocono for Andy Belmont in August. 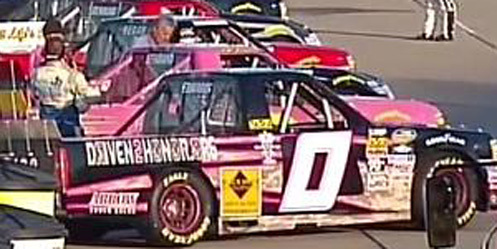 Earlier that year, Edwards ran the June Pocono event for owner-driver Norm Benning, parking Benning’s unsponsored #8 Chevrolet after one lap of the race. Benning and Edwards reunited at the Pocono track in 2012 where he again parked one of Benning’s backup vehicles - this time his #75 Chevrolet in the Camping World Truck Series - ending his series debut after 5 laps. Last year, Edwards ran Benning’s second truck in five more races, improving to a 28th-place finish in the 29-truck field at Michigan, but never completing more than 12 laps in any one event. The truck changed numbers twice more from #71 to Benning’s old #57 as Benning himself switched to the #6 at Eldora. Friday’s race at Texas was to be Edwards’ first start of the season and his first for Jennifer Jo Cobb. Days earlier, it was announced that Edwards would replace defending LASTCAR Truck Series Champion Caleb Roark in Jo Cobb’s own second truck, the #0 Chevrolet. Just 27 trucks were on that preliminary entry list, but by Friday another three late entries brought the grid to just two short of a full field: the #74 Mike Harmon Racing entry of Jordan Anderson, the #03 of dirt tracker Mike Affarano, and the #45 Tilted Kilt Chevrolet of B.J. McLeod. Affarano and McLeod would join Edwards in the Bottom Five. Anderson came home 24th. Edwards was 22nd-fastest in Thursday’s opening practice session and joined McLeod as the only two drivers to not participate in Happy Hour. He timed in 28th at an average speed of 159.546 mph, though was listed as in by Owner Points despite the short field. Teammate and team owner Jennifer Jo Cobb, who made her 100th Truck Series start on Friday, started 20th and would come home 19th. During the opening green-flag run, all five members of the Bottom Five pulled behind the wall and fell out of the race. Edwards beat Affarano by a single lap, followed two circuits later by Donnie Neuenberger in MAKE Motorsports’ #50 Burnie Grill Chevrolet. McLeod came home 27th followed two circuits later by Justin Jennings in another team truck, the #36 Mittler Bros. Machine & Tool Chevrolet. Mittler’s #36 has finished in the Bottom Five in 3 of its 4 starts so far this season. *This is the third last-place finish in the last four Texas races for Jo Cobb’s #0 team and the second in a row during the spring race. Last year, Ryan Ellis also scored his first last-place finish in the series after a vibration stopped him 2 laps into the event.